Type of wine: Sweet, intensely aromatic, strong red. Origin: A red-skinned member of the Muscat family of grapes. 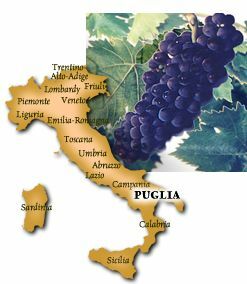 Mostly grown in Puglia (Apulia), the heel of the boot in southern Italy. Description: Bright, bluish-red color with assertive aromas of roses, lichee fruit and ripe wild blackberries. Often fortified, Aleatico typically boasts a rich texture and sweet fruit flavors. Aging: Fortified, Aleatico can age 10-20 years, developing aromas of faded violets and roses and earthy, dried plum flavors. Unfortified, it should be enjoyed young for its charming, vibrant fruitiness. Best location: While known to thrive in southern Italy and on the Island of Elba, it can, with extra attention, be grown successfully in colder climes. FastFoodFacts: Fortified: blue-mold cheeses, sharp, aged cheddar, sliced Macintosh or Granny Smith apples, Bosc pears, walnuts and hazelnuts. Unfortified: triple and double creme cheeses (St Andre, Brie, Camembert, Brillat-Savarin, etc.) and tarts and pastries with custard, apple, pear or berry fillings.